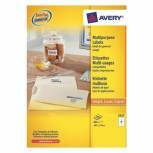 Avery Multipurpose Labels 38.1x21.2mm 65 Per Sheet White (Pack of 6500) 3666 Pack of 1 Avery Multi-Function Labels 3666. Multi use labels with permanent adhesive ideal for use on most types of printer. Easy to use with no adhesive bleed and sharp printing results. 65 per sheet. Avery Multipurpose Labels 70x42.3mm 21 Per Sheet White (Pack of 2100) 3652 Pack of 1 Avery Multi-Function Labels 3652. Multi use labels with permanent adhesive ideal for use on most types of printer. Easy to use with no adhesive bleed and sharp printing results. 21 per sheet. 70 x 42.3mm. Avery Multipurpose Labels 105x42.3mm 14 Per Sheet White (Pack of 1400) 3653 Pack of 1 Avery Multi-Function Labels 3653. Multi use labels with permanent adhesive ideal for use on most types of printer. Easy to use with no adhesive bleed and sharp printing results. 14 per sheet. 105 X 42.3MM. 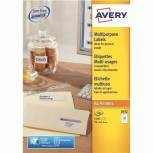 Avery DPS08-100 Multipurpose Labels 105x71mm 8 Per Sheet White (Pack of 800) 3427 Pack of 1 Avery White Copier Labels. 105x71mm. 8 labels per sheet. 100 sheets per pack. Avery DPS16-100 Multipurpose Labels 105x37mm 16 Per Sheet White (Pack of 1600) 3484 Pack of 1 Avery White Copier Labels. 105x37mm. 16 labels per sheet. 100 sheets per pack.